Released with a poster and a printed inner sleeve. Is there a way to decipher this pressing without opening the record? I have a shot at a sealed copy for $20. The HX-Dolby cassettes blow all CD and LP's out of the water. You can hear so much more. It's been said many times before, but this thing is nothing short of a masterpiece. You're not really a music collector until you've got it. will all the unreleased tracks that have just recently been released on the deluxe version CD ever going to see the light of day on vinyl? I collect vinyl, not CD's. killer album from a true genius! Has a wonderful live feel to it! Highly recommend picking up all the 12" single releases from this album for the extended versions done by Prince. Lets go Crazy 12" is wicked! I Would Die For U extended version is also cool! Just wish they put Computer Blue on a 12" though, but alas!! It was always Prince Vs Michael Jackson. Maybe it's only me, but his productions never sound polished like Michael Jackson's till "The most beautiful girl in the world". But maybe that was his thing seeing that he wrote, arranged, produce and played all the instruments ... but so did George Michael and Stevie Wonder! I have a pressing whose matrix/runout starts out like Variant 3 or 8, but then deviates. But I don't want to get into the weeds about it right now. I have 4500 more records to price for Gag-bit Vinyl in Bushwick NYC! Purple Rain is the sixth studio album by American recording artist Prince, the first to feature his backing band The Revolution, and is the soundtrack album to the 1984 film of the same name. It was released on June 25, 1984 by Warner Bros. Records. 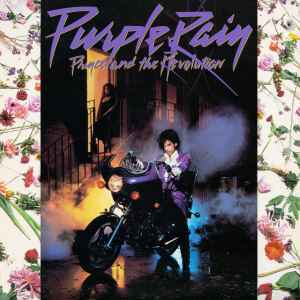 Purple Rain is regularly ranked among the best albums in music history and is widely regarded as Prince's magnum opus. Time magazine ranked it the 15th greatest album of all time in 1993, and it placed 18th on VH1's Greatest Rock and Roll Albums of All Time countdown. Rolling Stone magazine ranked it the second-best album of the 1980s and 76th on their list of the 500 Greatest Albums of All Time. Zounds magazine ranked it the 18th greatest album of all time. Furthermore, the album placed 4th in Plásticos y Decibelios' list of The Greatest Albums of All Time. In 2007, the editors of Vanity Fair labeled it the best soundtrack of all time and Tempo magazine named it the greatest album of the 1980s. In 2012, Slant Magazine listed the album at #2 on its list of "Best Albums of the 1980s" behind only Michael Jackson's Thriller. That same year, the album was added to the Library of Congress's National Recording Registry list of sound recordings that "are culturally, historically, or aesthetically important". This record has always been in the stack belonging to my family, though I never really picked it up. Tonight's the night that I will listen.